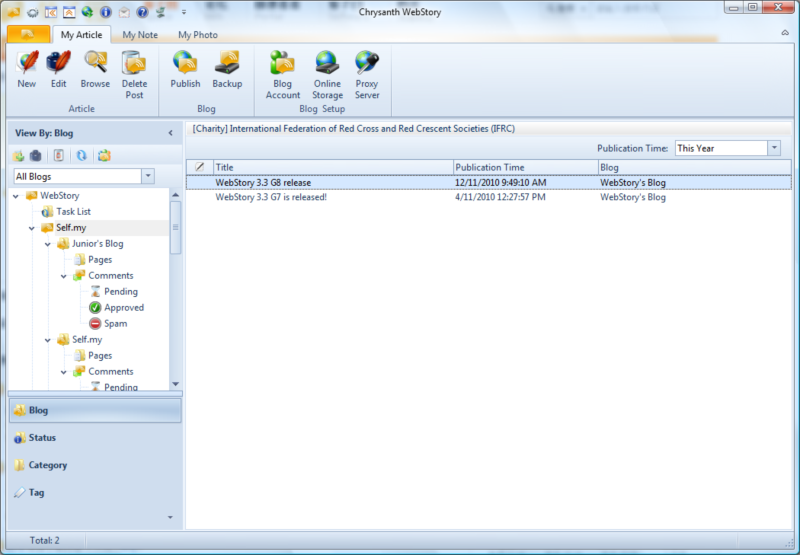 Chrysanth WebStory is a desktop blog management software that helps you manage and back up multiple blogs, Twitter and web albums easily. Through WebStory, you may be able to remotely manage your blog posts, including publish new posts or pages, edit/ delete published posts or pages. Supported blog servers and blog services include BlogSpot.com, WordPress.com, TypePad.com, WordPress blog server, MovableType, Drupal, Nucleus and others. You may be able to write your entire new post offline with WebStory, and format your content nicely without any HTML knowledge. Inserting images from your computer is also a snap. When everything is done, just one click will get your post and images published to you blog immediately. Another benefit is that, when your ideas are flowing while you are on the move, you may also post a twit to your Twitter account via your mobile devices, which may then be synchronized back to WebStory when you are back to your desktop. Vice versa, you may also post your new ideas anytime via WebStory back to your Twitter account, just to get yourself organized, or to prepare for your next blog post. Additionally, if you are maintaining a photo blog, then WebStory's web album support such as Flickr and Picasa will surely come in handy. You may publish and back up your photos to photo sharing sites or your own blogs easily. Qweas is providing links to Chrysanth WebStory 3.7G16 as a courtesy, and makes no representations regarding Chrysanth WebStory or any other applications or any information related thereto. Any questions, complaints or claims regarding this application Chrysanth WebStory 3.7G16 must be directed to the appropriate software vendor. You may click the publisher link of Chrysanth WebStory on the top of this page to get more details about the vendor.